Before it burned down, my mother's family's farmland held a tiny concrete home that was like a stargate to another time and dimension. Read more here. Inside were old relics, largely unmoved over the decades and among those relics was a trove of readable treasures I had previously known nothing about and the discovery of which changed my life forever: The old Good Housekeeping magazines. Losing them in the fire was the least of the sad items lost but still was sad. Until I got on ye olde ebay and purchased up a lapful of the vintage gems and now they display proudly in my sitting room. I have a difficult time trying to express why they are so wonderful and precious to me but I'll do my best to sum up. Essentially, it is the most perfect, unmolested, uncontaminated inadvertent time capsule you will ever come across, only to be buried by other forgotten items in a hoarder's attic (hoarders I love and owe my life to). Any old magazine, I'm now realizing, would be an immediate transport back in time but the Good Housekeeping, I believe, particularly captures the essence of American culture and, frankly, the human psyche during certain eras. It is the most perfect history lesson and when you open it, you've stepped inside a time machine. Inside, we see styles in fashion, furniture, general home decor. You might see the gradual transition of the flowery 50's to, in my opinion, the more typical "mid-century" style of the mod 60's, but like, they didn't know it at the time. But you do! You know the end! To flip through the pages feels omniscient and it's alarming and exhilarating. I looooove it. More than that, though, we see attitudes, general belief trends, science views, child-rearing practices, SEVERE blatant sexism and an absolute non-existence of non-white culture or representation thereof. I read an article that was actually titled something like "how women can stop being so useless" and it was NOT a joke. Basically it was how men work hard at jobs and women should come with certain homemaking skills when they marry. Aye aye aye! But it's not spoken or written about retrospectively. It's the current view of the time, completely unaware of the future, without acknowledgement of any other lines of thinking. It's widely accepted as everyone's reality, an actual real snapshot printed and published. The "science" is bizarre but was then commonly accepted-- doctors promoting cookies for children as a healthy snack, for instance. It makes you scoff and then sit and wonder what current, scientifically-proven facts that we believe now are possibly going to be later debunked or discarded. And then, oh my, there's the copy, the text! The captions! Ohhhh they just tickle me so. They are lengthy, oftentimes bizarre. Sean and I imagine Madmen-type guys sitting around with pens in their mouths coming up with a really good paragraph for sanitary napkins. In addition, and one of my favorite elements, are the styles and trends of food prep and really outrageously gross recipes. 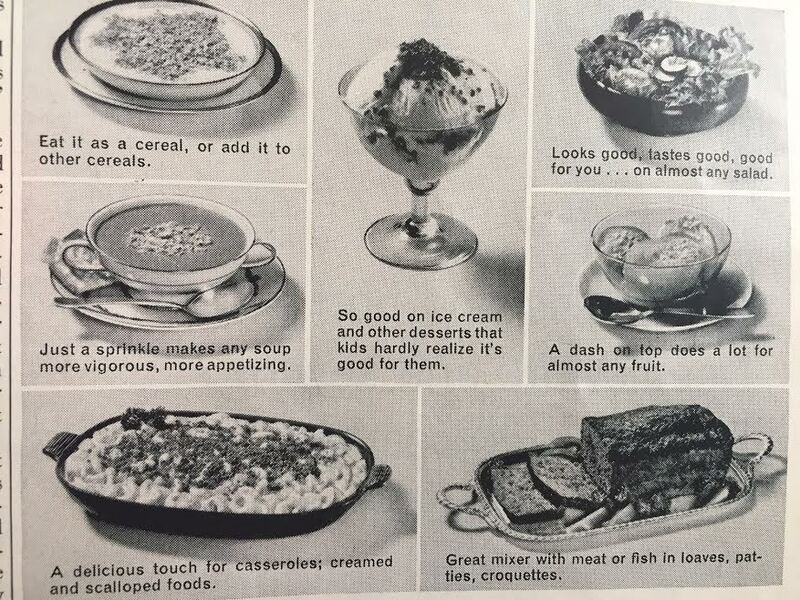 The microwave, for instance, was a new hot item and for a time, the goal was to cook ev-er-y-thing in it. Roasts and fish and complex casseroles. It's just outstanding, and super nasty. In particular, gelatin in some form was apparently expected for every single meal, as was using molds, which makes sense. The goal, it seems to me, was to incorporate as much random and completely incompatible food items together into one giant mold. You marvel and wonder how anyone could think such a thing was appealing. The other day we made up a game where I sat reading recipes to Sean who, mystified, had to visualize and then attempt to describe to me what he thought it would look like. I'd then reveal the image and we'd see how close he got, and then make puke faces. BEST. I thought I'd make this a series because there are too many gems to skip over. )en's Log is going retro. For now I'll share just a couple of images that i've been texting to friends. They delight me to no end. 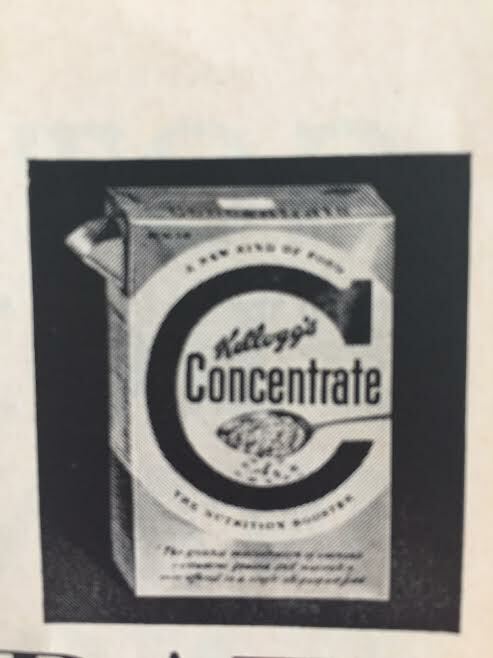 Looking at the ad here, can you guess what ingredient they are referring to? I'll give you a minute to think. Got your guess? It's fuzzy. Kellogg's concentrate(?) I believe this might be some form of cereal, maybe like Grape Nuts/Grape Nut Flakes? Question mark? Nobody knows. Ha ha ha! 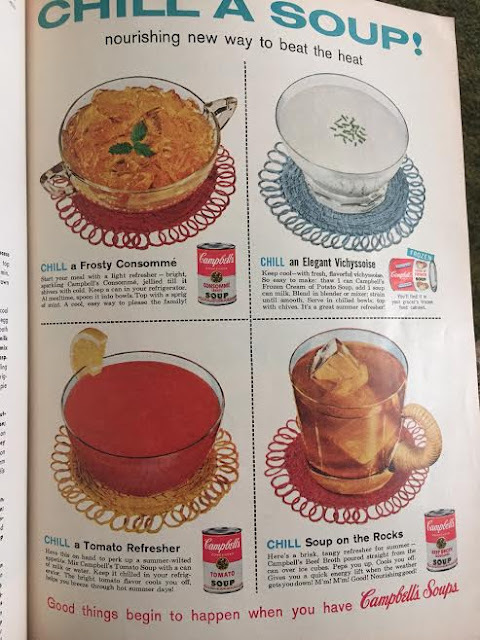 Chill a soup! Soup on the rocks! Ice-cold refreshing consomme BROTH. AAAHH. It's like some weird but still entertaining nightmare.